Richard G. Schaefer, III, 70, of Harleysville, passed away peacefully with his loving wife, Rhonda, at his side on Sunday, June 10, 2018, at Lehigh Valley Hospital-Cedar Crest Campus, Salisbury Township. He was the beloved husband of Rhonda C. (Cressman) Schaefer for 36 years. Born in Phoenixville, he was the son of Emma (Villanova) Schaefer, of Norristown, and the late Richard G. Schaefer, Jr. Rick was a 1966 graduate of Bishop Kenrick High School, Norristown. Mr. Schaefer had been employed for 44 years in the Research and Development Department at Merck, West Point, retiring in 2012. He was a member of St. Maria Goretti Parish, Hatfield. Rick was a long-time social member of the Warren Royer American Legion Post 234, Souderton. Rick was a true leader and mentor to our youth through his many years of coaching. He began out of high school coaching football at Visitation BVM High School, Norristown, and then later for the youth football program at Lower Providence. For over 15 years Rick was the head coach for the Souderton Area Youth Football Association, also serving on the administrative board. He had also been an assistant coach at Indian Crest Middle School and Souderton High School. He had also worked for more than 20 years on the Souderton High School football chain crew. 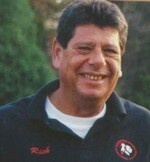 In addition, Rick also coached youth basketball in the Souderton area for ten years. Rick was an avid golfer and also enjoyed fishing. His true joy came from watching his children and grandchildren from the sidelines of their sporting events. Rick always welcomed everyone with open arms and made you one of his own. In addition to his wife and mother, Mr. Schaefer is survived by his children, Ryan James Schaefer, of Harleysville; Michael J. Rowan and his wife, Kathryn, of Souderton; three grandchildren, Mason, Mikey, and Myla; his siblings, Kevin Schaefer and his wife, Donna, of West Chester; Denise Jeitles, of Norristown; and Keith Schaefer and his wife, Mary Jo, of Collegeville. In addition to his father, he was preceded in death by a daughter, Melissa, in 1993. A visitation will be held from 6-8 p.m., on Tuesday, June 19, 2018, in the Betty Meier Steeley Funeral Home, 87 North Main Street, Sellersville, PA 18960. A second visitation will be held from 9:30- 10:45 a.m. on Wednesday, June 20, at St. Maria Goretti Parish, 1601 Derstine Road, Hatfield, PA 19440, where a Mass of Christian Burial will be celebrated at 11 a.m.
Interment will follow in Sellersville Cemetery. In lieu of flowers, memorial donations may be made in his name to Lehigh Valley Health Network, Office of Philanthropy, 2100 Mack Blvd., P. O. Box 1883, Allentown, PA 18105-1883. To send flowers to the family of Richard G. Schaefer III, please visit our Heartfelt Sympathies Store.